Children commonly present to the emergency department (ED) with a febrile illness and a rash. Approximately 70% of such cases are attributable to viruses, such as coxsackie, echovirus or the enteroviruses. The rest result from bacterial infections such as streptococcal and staphylococcal infections, mycoplasma, rickettsial diseases, drug-related causes or Kawasaki disease. Some illnesses are associated with a typical rash, which can lead to a definite diagnosis. In other cases, the clinical features may not be specific enough to enable an accurate diagnosis. 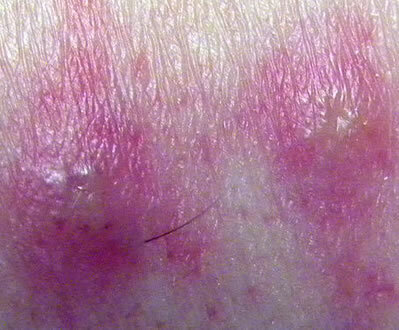 Exanthems are eruptive skin rashes associated with a fever or other constitutional symptoms. They arise from an infectious disease or may be drug-related. Vaccination programmes have resulted in a reduction in the occurrence of many of these illnesses. At the same time, however, newer causes of exanthems such as Gianotti-Crosti syndrome have emerged. Enanthems are eruptive lesions on the mucous membranes occurring as a symptom of disease. Important: Due to recent reductions in the uptake of vaccinations, you, as an emergency medicine clinician, should be alert to the common childhood exanthems and be able to take a relevant history, conduct an appropriate examination and be aware of the complications that can arise. Six separate childhood exanthems were defined in the late 19th, early part of the 20th Century. These were named in the order they were discovered and are outlined in the table below. The term fourth disease or Dukes Disease is thought to be a variant of scarlet fever and is no longer used. Chickenpox and Small Pox were two other classic childhood exanthems recognised as separate from one another in the 18th century. Tropical Viral exanthems are also common in certain regions, however these will not be covered in this learning module. When clinically assessing childhood exanthems, start by recording the patients vital signs and the distribution and appearance of the exanthem. Which features associated with the distribution of the exanthem should you record? These are features associated with the appearance of the exanthem that should you record? Childhood exanthems vary greatly depending on factors such as location, size, elevation, palpability and the content of the associated skin eruptions. A macule is a circumscribed area of change in normal skin colour, with no skin elevation or depression. It may be any size. A papule is a solid raised lesion up to 0.5 cm in greatest diameter. Note, however, that some text definitions use 1.0 cm as a cut-off limit instead of 0.5 cm. 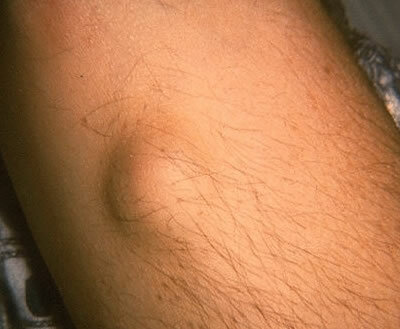 A nodule is similar to a papule but is located deeper in the dermis or subcutaneous tissue. Nodules are differentiated from papules by palpability and depth, rather than size. A plaque is an elevation of skin occupying a relatively large area in relation to its height. 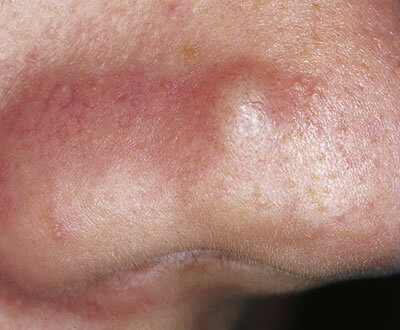 It can often be formed by a confluence of papules. A pustule is a circumscribed elevation of skin containing purulent fluid of variable character. The fluid may be white, yellow, greenish or haemorrhagic. A vesicle is a circumscribed, elevated, fluid-containing lesion less than 0.5 cm in its greatest diameter. It may be intra-epidermal or sub-epidermal in origin. A bulla is similar to a vesicle, except the lesion is more than 0.5 cm in its greatest diameter. Note, however, that some text definitions use 1.0 cm as a cut-off limit to replace 0.5 cm. Maculopapular eruptions are seen most commonly in viral illnesses and immune-mediated illnesses. The most common causes of maculopapular eruptions are shown in Table 1. The majority of children with diffuse erythema will present with a fever and non-specific symptoms. The most common causes of diffuse erythema with desquamation are shown in Table 2. Vesicobullous or pustular eruptions are linked to infections, acute ezcematous tissue reactions, trauma or inflammatory bullous disorders. The most common causes of infection-related vesicobullous or pustular eruptions are shown in Table 3. 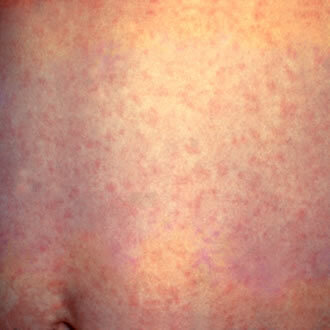 Measles is caused by a paramyxovirus and occurs in epidemics in winter and spring. It is still a leading cause of morbidity and mortality; especially in less developed countries. The infection is spread by droplets, or, less commonly, by aerosol spread. The primary site of infection is the nasopharynx. The incubation period for measles is typically 7-21 days. The infectivity period usually commences several days before the onset of the symptoms and lasts until up to 4 days after the appearance of the characteristic rash. 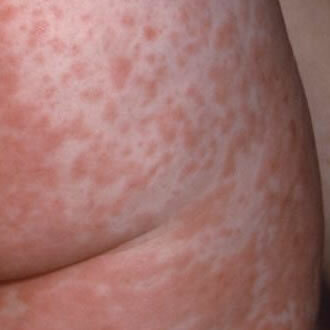 Measles is characterised by an erythematous maculopapular rash beginning on the head, with a cephalocaudad progression. The clinical case definition of this disease has been defined as a fever >38.3 C or felt hot if not measured, a generalised maculopapular rash lasting in excess of 3 days and at least one of: cough, conjunctivitis or coryza. The clinical case definition of measles has a low positive predictive value in settings of low prevalence and therefore a laboratory diagnosis is important . The investigation for measles is performed using oral fluid or serum sampling for measles immunoglobulin M (IgM) antibody. In acute cases, measles can be detected by taking throat swabs or testing the urine. The treatment of measles is largely symptomatic and the majority of children will recover uneventfully. Patients should be advised to attend, however, if symptoms do not resolve within 1 week or if unusual symptoms develop. High fatality rates are still seen in more vulnerable patients, e.g. the immunocompromised, the malnourished and those living in less developed countries. In these instances, a range of additional treatment options can be considered. Measles occurs in epidemics in winter and spring, the infection is spread by droplet spread or less commonly by aerosol spread. The primary site of infection is the nasopharynx. Incubation period is approximately 7-21 days. Infectivity is several days before the onset of the symptoms up to four days after the appearance of an erythematous maculopapular rash beginning on the head with a cephalocaudad progression. Individual lesions can coalesce and fade by the fifth day. The clinical case definition of this disease has been defined as characterised by fever > 38.3 C or felt hot if not measured, a generalised maculopapular rash > 3 days and at least one of the 3 Cs cough, conjunctivitis, coryza. Scarlet fever or scarlatina is an exotoxin-mediated disease arising from Group A beta-haemolytic streptococci (GABHS). Over one hundred different M protein types have been identified. The organism is mainly spread by aerosol or droplet spread; although it can also be found in contaminated foods. The incubation period for scarlet fever is usually 2-5 days. The infectivity period is about 5 days from when the patient is given antibiotics. Scarlet fever usually begins with a sore throat, headache, fever, tender cervical lymphadenopathy and malaise. In children, abdominal pain may also occur. This is then followed by a confluent erythematous rash (A) with a sandpaper-like quality. A broad spectrum of clinical presentations are associated with scarlet fever (Table 1). A variety of diagnostic tests for scarlet fever are available, e.g. streptococcal antibody test, throat swab culture test and rapid diagnostic tests. There are, however, limitations associated with each type (Table 2). Antibiotic treatment is indicated (penicillin V or erythromycin or cephalosporin) for 10 days. Health Protection Agency guidance advises that children diagnosed with scarlet fever should be excluded from school for 5 days following the commencement of antibiotics. The majority of texts advise 24 hours off school post-commencement of antibiotics for group A streptococcal pharyngotonsillitis alone. Problems can arise from a range of complications associated with scarlet fever (Table 3). Note that the risks of post-streptococcal glomerulonephritis and acute rheumatic fever in the UK are low. Rubella is a self-limiting benign illness occurring in adults and children worldwide. It is caused by the rubella virus and spread by airborne transmission or droplet. The incubation period for rubella is around 2 weeks after which a prodrome of headaches, fever and lymphadenopathy occur. The infectivity period is typically from 7 days before to around 7 days after the onset of the characteristic rash. Another characteristic is the appearance of Forschheimer spots. 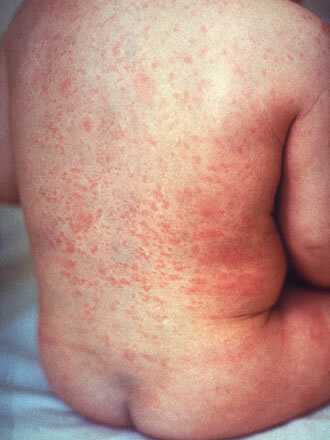 These are pin-point red macules and petechiae, which may be seen on the soft palate and uvula during the rash phase. The clinical signs of rubella can be difficult to distinguish from other viral illnesses such as parvovirus B19, measles, dengue and human herpesvirus 6. Clinical diagnosis of rubella is therefore unreliable and laboratory confirmation of the disease is required, particularly during pregnancy due to the potential consequences to the foetus. Immunoglobulin G and Immunoglobulin M assays should be used. Women should avoid pregnancy until 3 months after immunisation. 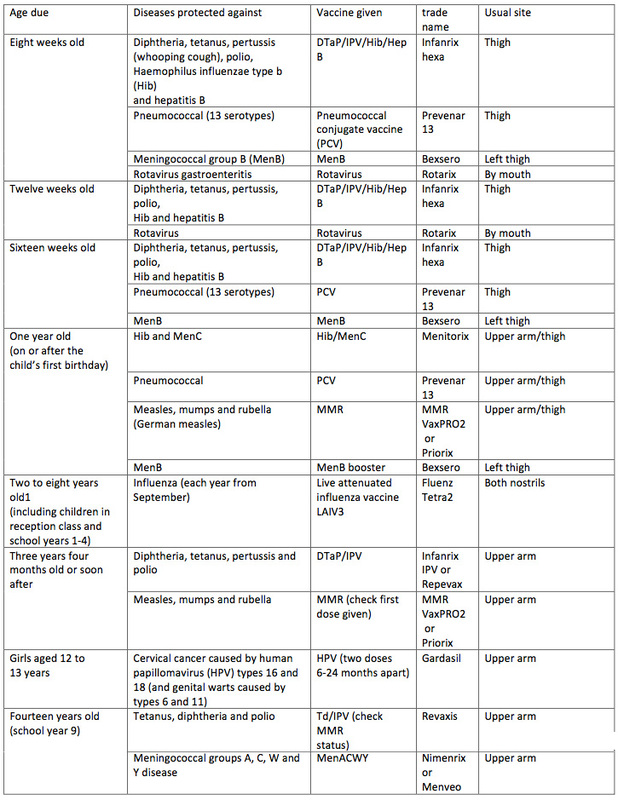 Complications of rubella are rare, although a number of conditions can arise (Table 1). The risks of congenital defects (congenital rubella syndrome) are highest (90%) if infection occurs within the first 12 weeks of pregnancy. Under these circumstances, follow-up should be arranged. Erythema infectiosum is caused by parvovirus B19, a highly infectious human pathogen found around the world. It is predominantly spread in respiratory droplets but can also pass from mother to fetus and in blood transfusions. Fever and non-specific symptoms occur early and these are followed approximately 2-3 weeks later by a rash and arthropathy. The classical rash is described as having a slapped cheek appearance and lasts for up to 4 days. The rash is a confluent, erythematous, oedematous rash with patches or plaques on cheeks, with sparing of nasal bridge and periorbital areas. This is followed by a maculopapular rash to the trunk and limbs. 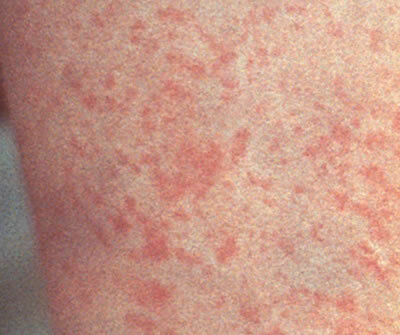 This rash can vary in intensity and duration. As the rash begins to fade it can take on a lacy appearance. A broad spectrum of clinical presentations are associated with erythema infectiosum and these are presented on the next page. The clinical presentations of erythema infectiosum are shown in Table 1. The majority of patients with erythema infectiosum do not need investigations unless there is a history of immunocompromise or haemoglobinopathy or unless a patient is pregnant. Immunoglobulin M antibodies appear around 10 days post-infection and remain detectable for up to 2-3 months. Immunoglobulin G antibodies appear around 14 days post-infection and remain for life. 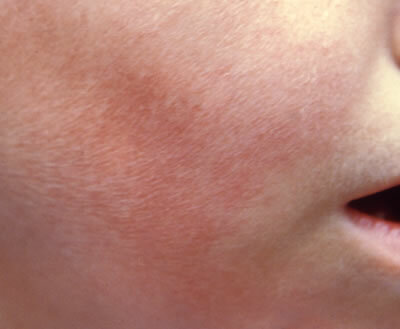 Erythema infectiosum is a mild self-limiting illness for most children. Treatment is largely symptomatic for the majority of patients, although analgesia may be needed to help the patient cope with joint pains. Transfusion may also be indicated for patients with aplastic crises. Intravenous immunoglobulin containing pooled neutralising anti-B19 antibody has been used to treat immunocompromised patients. Pregnant women in contact with, or with, suspected parvovirus B19, should have serological testing. Referral to an obstetrician for regular monitoring and follow-up is also required. Patients with haemoglobinopathies, immunocompromise or in pregnancy may experience complications if exposed to parvovirus B19. Under these circumstances, appropriate serological testing, investigations, management planning and follow-up are required. Transient aplastic crises can also occur in those with, and without, underlying chronic haemolytic illness. Viral transmission in pregnancy is more likely to occur during the first and second trimester. Foetal hydrops is more likely to occur in the second trimester. Estimated transplacental infection of women who are infected in pregnancy is around 30% with a 5-8% risk of foetal loss. 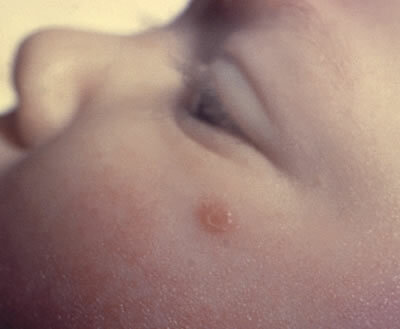 Exanthem subitum (otherwise known as sixth disease or roseola infantum) is caused by human herpesvirus 6 (HHV-6) and human herpesvirus 7 (HHV-7). HHV-6 is particularly widespread and nearly all children will acquire the infection early in childhood. HHV-6 infection results in a common benign illness and is a common cause of fever and febrile seizures in infants. Exanthem subitum is associated with a mild respiratory illness, 3-5 days of fever and cervical lymphadenopathy (in 30% of cases). 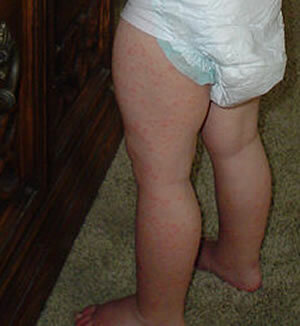 Some 10% of infants develop the characteristic rash, which appears as the fever disappears. It commences behind the ears, taking the form of discrete blanching macules and papules surrounded by halos. It typically lasts for 1-2 days. Prenatal and perinatal infections are uncommon due to the presence of maternal antibodies. Serological testing for exanthem subitum is not necessary in the majority of cases. Human herpesvirus 6 causes a benign illness and anti-viral therapy is not needed in the majority of cases. Children may, however, present with a febrile seizure, which may need admission for a period of observation. The child may warrant investigation and management for a septic illness if the clinical course does not present or improve as expected. Reactivation of the virus can occur in transplant recipients. 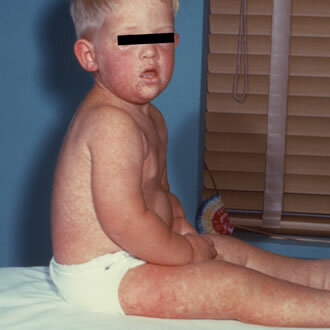 The rash with exanthem subitum is often misdiagnosed as measles. A number of rare central nervous system complications associated with exanthem subitum are shown in Table 1. 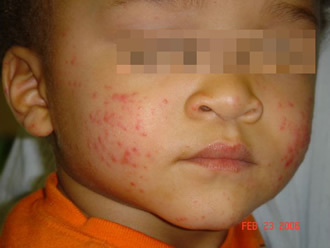 Chicken pox is a common highly infectious illness found worldwide. It is caused by the varicella zoster virus and is spread via respiratory droplets. The incubation period for chicken pox is usually 10-21 days. The infectivity period starts when symptoms first appear and lasts until all the lesions have crusted over. This is usually around 5-6 days after the onset of the illness, with most crusts disappearing by 20 days. 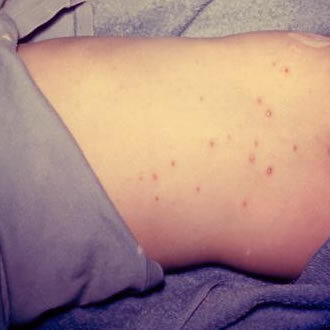 Chicken pox is a coryzal-type illness with itchy fluid filled vesicles, which progress over the trunk around 3-5 days. It is possible to be infected with no symptoms. Fever tends to resolve by day 4. Chicken pox is a very common illness and the vast majority of cases can be managed symptomatically at home. Prolonged fever >4 days should prompt the suspicion of complications of varicella such as secondary bacterial sepsis. Under these circumstances, patients should be examined carefully with appropriate blood test work up and a chest x-ray, depending on their clinical presentation. Oral acyclovir has been shown to reduce the effects of chicken pox, for example the number of lesions and duration of fever, if used within 24 hours of the onset of rash in immunocompetent children. Oral acylovir has not been shown to reduce the incidence of varicella zoster virus pneumonia or other complications when compared to placebo. Cochrane results do not support the widespread use of acyclovir in immunocompetent children . Varicella zoster immunoglobulin (VZIG) should be given to neonates whose mothers develop the rash 7 days before or 7 days after the delivery, to reduce the risk of severe neonatal varicella. Problems may arise where there is a failure to recognise the complications of secondary streptococcal or staphylococcal infections or to appropriately manage high-risk groups. A prolonged fever for more than 4 days in a child with chicken pox, for example, should prompt the suspicion of secondary bacterial complications . A range of complications including pneumonia, bacteraemia and encephalitis are increasingly being recognised (Table 1) . Neurological complications may occur without a preceding rash . The incidence of congenital varicella syndrome is low if maternal infection occurs before 20 weeks of gestation. Congenital varicella syndrome is associated with shortened limbs, skin scarring, cataracts and growth retardation. Ibuprofen should not be used for fever control with chicken pox due to the established risk of developing necrotising fascitis. 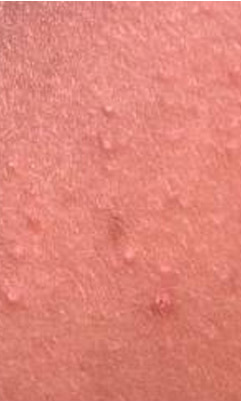 Gianotti-Crosti syndrome is a papular acrodermatitis. It is a self-limiting illness peaking between 1 and 6 years of age and is associated with a range of viruses and bacteria (Table 1). Children with atopic dermatitis are more often affected and an association with immunisation is recognised. 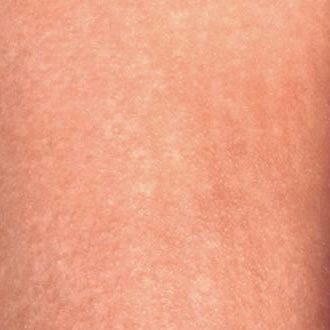 The rash is characteristically papular or papulovesicular in form and symmetrically distributed on the face, buttocks and the upper and lower extensor surface of the extremities. The trunk, however, is usually spared. Lesions can last from 5 days up to 12 months, although most heal within 2 months. Image reproduced with permission from Medscape. Article: Dermatologic Manifestations of Gianotti-Crosti Syndrome. Investigations of Gianotti-Crosti syndrome are rarely indicated unless there is diagnostic uncertainty or presence of physical findings, e.g. hepatomegaly. Further management of Gianotti-Crosti patients is rarely indicated unless there is diagnostic uncertainty or atypical presentation. Under these circumstances, follow-up is indicated. Antihistamines may be needed with some patients for treatment of pruritus. Complications of Gianotti-Crosti syndrome are rare but can include chronic liver disease secondary to hepatitis B infection. Notification of specified infectious diseases is a legal requirement under the Public Health (Control of Disease) Act 1984 and the Public Health (Infectious Diseases) Regulations 1988. Clinically suspicious cases of a notifiable disease must be notified, although notification can be changed later if the initial diagnosis proves incorrect. The primary purpose of notification is to identify potential outbreaks and epidemics rapidly. At the time of writing, there are 30 notifiable diseases. A fully up-to-date list is published on the Health Protection Agency website. Several of the diseases referred to in this session are notifiable infectious diseases. Notification procedures may vary locally but are based on a number of common key points. The measles, mumps and rubella (MMR) vaccination was introduced in 1988 and forms a key part of the current immunisation schedule. Coverage initially exceeded 90% and measles notifications declined to their lowest point in UK history. 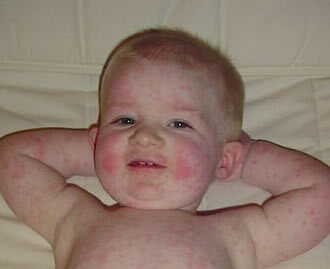 Uptake of the vaccine fell, however, between 1995 and 2003, resulting in measles outbreaks in the period 2006 to 2008. Similarly, the incidence of rubella has been markedly reduced over recent decades. As a consequence, many junior clinicians lack experience in dealing with the clinical features of rubella. The side effects of the MMR vaccine are a fever, usually in the second week after immunisation, and a rash. Fitzpatrick TB, Johnson RA, Wolff K et al. Color atlas and synopsis of clinical dermatology: common and serious diseases. 3rd edn. New York: McGraw-Hill, 1997. Habif TP. Clinical dermatology: A color guide to diagnosis and therapy. 3rd edn. St. Louis: Mosby, 1996. Hutchins SS, Papania MJ, Amler R et al. Evaluation of the measles clinical case de?nition. J Infect Dis 2004;189:153-159. Huiming Y, Chaomin W, Meng M; Cochrane Acute Respiratory Infections Group. Vitamin A for treating measles in children. Cochrane Database of Systematic Reviews 2005;4: aCD001479. doi: 10.1002/14651858.CD001479.pub3. Armengol CE, Schlager TA, Hendley JO. Sensitivity of a Rapid Antigen Detection Test for Group A Streptococci in a Private Pediatric Office Setting: Answering the Red Books Request for Validation. Pediatrics 2004;113(4):924-926. Pollard AJ, Isaacs A, Lyall EGH et al. Education and debate: Potentially lethal bacterial infection associated with varicella zoster virus. Br Med J 1996;313(7052):283-285. Cameron JC, Allan G, Johnston F et al. Severe complications of chicken pox in hospitalised children in the UK and Ireland. Arch Dis Child 2007;92:1062-1066. Koskiniemi M., Piiparinen H., Rantalaiho T., Ernko P., Frkkil M, Riha K.Acute central nervous systems complications in varicella zoster infections. J Clin Virol 2002;25 (3):293-301. Very well written; descriptive but may be more useful with pictures rather than hyperlinks. detailed very informative description .